Here is the promised gluten-free Pecan Sandies recipe. This is from the very talented, Cara Reed‘s Decadent Gluten-Free vegan Baking book. I bake a great deal though gluten-free goodies are not my forte. This excellent book may change all that. Mix everything together with a fork in a medium bowl until dough begins to form. It might be crumbly: simply place the dough on a piece of parchment paper and gently knead until a smooth ball is formed. Roll between 2 pieces of parchment until 1/4 inch. Cut into circles with 2 inch cookie cutter. Place on baking sheet and lightly dust with powdered sugar. Thank you, Cara, for making gluten-free, vegan baking such a pleasurable experience. The eating is even better! Though I’m not proud of it, I can remember a time back in high school when I would demolish a bag of Pecan Sandies in two days. My eating habits have changed remarkably over time and cookies are not a big part of my life, but now that I’ve made a veganized version of this old favorite, I may be in trouble. They are really good! Be careful! Preheat the oven to 350 degrees. Place the small diced pecans in a single layer on a cookie sheet with a silpat or a piece of parchment paper. Toast the pecans for four to seven minutes. It really depends on how accurate your oven is. The last thing we want is burnt pecans, so check for toasty goodness at four minutes, unless you know your oven very well. When the pecans are done, you can turn off the oven, but just don’t forget to preheat again, closer to the time you’ll be rolling out your dough. Cream the vegan butter with the sugar with a hand mixer, a stand mixer, or a wooden spoon. Add the extracts, and mix in well. Sift in the flour and the salt, and mix to combine. Add the pecans. I used my hands at this point to incorporate the flour and pecans. The dough will be crumbly with all of those pecans, but don’t worry. Form two or three balls of dough, and flatten them with your hands to form disks. Cover them with plastic wrap, and chill for about 30 minutes. Preheat the oven during the last half of your chilling time. Take the chilled dough, and place it on a floured surface. Since the dough is crumbly, I used both a floured rolling pin and my hands to roll and pat the dough to 1/2 inch thickness. Cut out shapes of your choosing, and place the cookies on a cookie sheet with a silpat or parchment paper. The dough is delicate, and it may be break apart. Just piece it back together with a few pats, and know that it will stay together after it is baked. Bake for 20 to 25 minutes in the center of the oven until the edges are beginning to brown. Allow to cool on the pan before you dig in. Enjoy with a big glass of non dairy milk or a cup of tea. What’s a baker to do? I had already had my nice, healthy breakfast of steel cut oats with banana, but these scones had just come out of the oven. The scent is delicious, but I’ve never made these before, and I wouldn’t want to post something that might hurt Triangle Chance for All‘s reputation. A taste test was necessary! I did it for all of you, and I’m happy to report that my first attempt at a gluten-free maple scone is a winner! They can also be made with wheat flour, if you prefer, though I think the blend of millet flour and oat flour that I made for this recipe adds to the nutty, wholesome taste and texture. If you do use wheat flour, leave out the xanthan gum. Preheat the oven to 425. Prepare a scone pan by lightly oiling it. You may also use a cookie sheet to spoon the dough onto, if you don’t have a scone pan. Remember to line the pan with parchment paper or a silpat. Stir the flour, xanthan gum, baking powder, and salt all together in a medium bowl. Cut in the cold butter with a pastry blender or two knives until the flour mixture is crumbly. Stir in the soy milk, maple syrup, and maple extract and mix all together until combined. Drop even amounts of dough into your scone pan or onto your cookie sheet. Bake 15 to 20 minutes or until they’ve browned lightly. Cool on a rack for about ten minutes before adding the maple glaze. Mix the ingredients all together, and top the scones with it and some toasted pecans. I did use her wonderful gluten free blend in this recipe and in others. Here is a very easy, gluten-free fudge recipe that you can whip up in minutes. Line a 8 x 8 pan with wax paper. Melt chocolate chips along with coconut cream, non dairy milk or creamer, and salt in a heavy saucepan over low heat until the mixture is smooth. Remove from the heat, and stir in your optional ingredient/s. Chill at least two hours. Peel off the wax paper, and cut into shapes of your choosing. Store in the refrigerator. 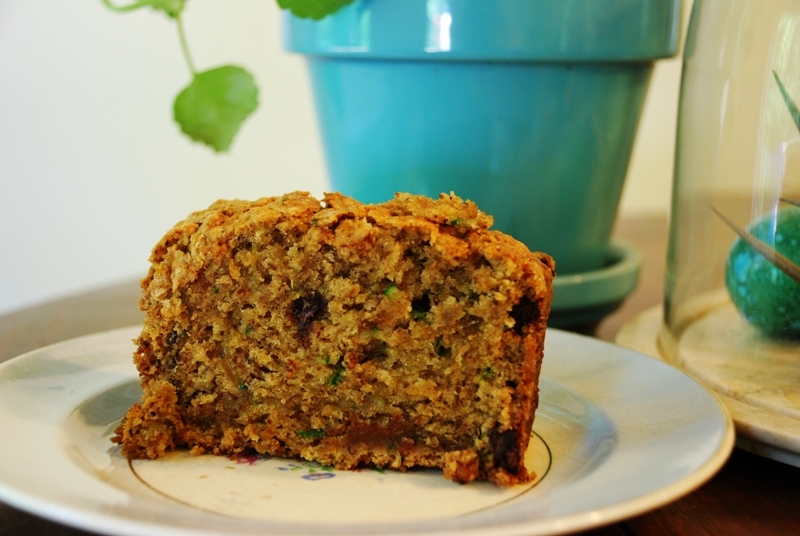 Now that zucchini are in season, we feel it almost a duty to make vegan zucchini bread. Zucchini (and other summer squash) have a multitude of uses, fresh or cooked or baked into things, but I always feel a little special when grated zucchini works its way into a loaf of bread. Zucchini bread can be kind of tricky to get right; I have made far too many “loaves” that ended up being pudding bread. The end result will almost always be moist, but this recipe turned out well and mighty tasty. Preheat the oven to 350 F. Lightly grease a 9″ loaf pan. In a large bowl, combine the flour, ground flax seeds, salt, baking soda, baking powder, and ground cinnamon. In another bowl, whisk together the sugar, oil, non-dairy milk, and vanilla extract until well combined. Add the wet ingredients to the dry, along with half of the grated zucchini. Mix until well combined, then fold in the remaining zucchini. Fold in the chocolate chips. Transfer the batter to the loaf pan and bake for 70-75 minutes, or until a knife inserted in the center comes out clean. (It is a good idea to check the bread after about 55-60 minutes, just to make sure it is not getting too done on top.) Remove from the oven and allow to cool before serving. Alan and I went blueberry picking after a mama deer and her baby ate every berry from our new bushes. We came home with 10.5 pounds of berries! We froze some, I baked a pie and muffins, and I made yummy, easy bars. I can’t imagine our ever growing tired of anything and all things blueberry! I really do understand why our deer friends cleaned off our bushes so well. In a medium bowl, stir together 1 cup sugar, 3 cups flour, and baking powder. Mix in salt and lemon zest. Use a fork or pastry cutter to blend in the vegan butter and flax seed egg. Dough will be crumbly. Pat half of dough into the prepared pan. In another bowl, stir together the cornstarch, lemon juice, and cinnamon. Gently mix in the blueberries. Sprinkle the blueberry mixture evenly over the crust. Crumble remaining dough over the berry layer. Bake for 45 minutes, or until top is slightly brown. Cool completely before cutting into squares. Store in the refrigerator. My “far away grandma” (to differentiate her from my “close by grandma”!) was a gifted baker. My seven siblings and I can talk about Grandma’s bags of goodies for hours when we get together. She had a tradition of sending my family and my cousins’ families home with bags and bags of fudge, cookies, cakes, and popcorn balls every Christmas. How we loved those magical bags! Now that I am vegan, I’ve taken my grandma’s old recipes and made them my own. With just a couple of changes, they taste just like grandma used to make, but they are true to my ethics. Some traditions are so worth continuing while others should be examined and discarded. I love knowing that vegans can have their cake, fudge, or cookies while bringing greater peace into the world. Here is my Grandma Stonebrook’s Banana Nut Cookie recipe veganized! the equivalent of one egg replaced, use extra banana, egg replacement powder, or applesauce. Preheat the oven to 350 F. Line a couple of cookie sheets with silpats or parchment paper. In a medium bowl, cream the butter and the sugar/s until fluffy. Add the egg replacement, and beat until fluffy again. In a separate bowl, mash the bananas (2 to 3), add the baking soda, and allow the mixture to sit for a couple of minutes. Add the banana mixture to the butter/sugar mixture, and mix to incorporate. Whisk the flour with the salt and spices, and add it to the wet ingredients. Mix only until combined. Add the nuts. Drop tablespoons of dough (it will be of thick batter consistency) onto the baking sheets about 1 inch apart. Bake for 11 to 13 minutes. You won’t believe the aroma in your kitchen! Any time is a good time for tea time at our house, and while a straight cup of steaming tea is almost always more than adequate, we sometimes like to have a treat to nibble on as well. 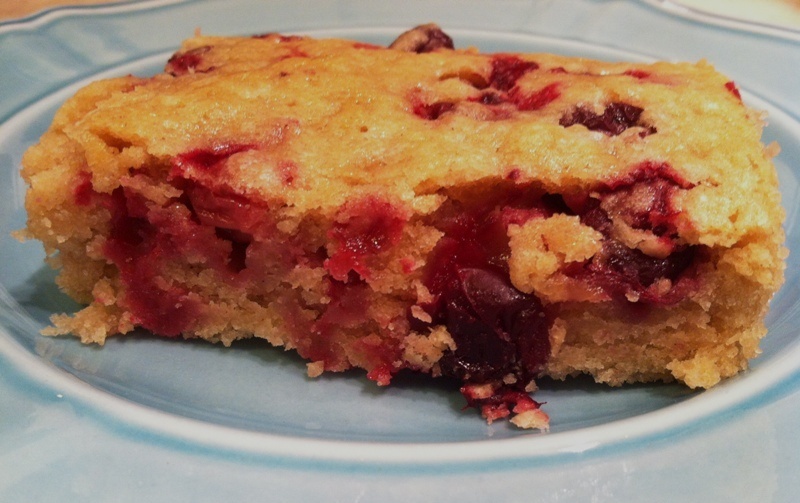 This Cranberry Tea Cake will appeal to those who love sweets and those with less of a sweet tooth (when coupled with tea). The tartness of the cranberries cuts the sugar’s sweetness, while the coconut gives the cake a satisfying richness, and a hot cup of tea rounds out the flavors splendidly. Combine the coconut milk with the vinegar and set aside for 30 minutes. Preheat oven to 350 F. Lightly oil a 9″x9″ baking pan. Combine the dry ingredients in a medium mixing bowl and mix well. Mix together the coconut milk and vinegar, non-dairy milk, maple syrup, and vanilla extract, then add to the dry ingredients along with the coconut oil. Mix until thoroughly combined. Fold in the cranberries. Pour the batter into the pan and spread out evenly; if the batter seems a bit dry, do not worry as it will moisten during baking. Bake for 35-40 minutes, or until the edges turn golden and a toothpick inserted in the center comes out clean. Remove from the oven and allow to cool. The cake will set as it cools. Once completely cooled, cut into 8 pieces. – Adapted from Vegan Chocolate by Fran Costigan. When Alan and I were in Scotland, we tried the vegan haggis, had a great gourmet vegan dinner in Edinburgh, and otherwise ate our weight in Scottish oatcakes that we found in a tiny corner store. We couldn’t believe our luck when we read the ingredients and found they were vegan! I was determined to find them when we returned, but all the commercial brands in this country have animal ingredients or palm oil. So I determined to make my own. Here is the recipe I came up with. Start them at least eight hours before you want to eat them because they do have to sit to soften. Mix the oats and flour with the vegan buttermilk and hot water in a medium bowl. Cover, and leave on the counter overnight or enough time to have the ingredients soften. In the morning, preheat the oven to 325. Mix the melted vegan butter, salt, and baking soda into the softened oat/flour mixture. Use your hands to mix into a dough that holds together. If it is too dry, add a tablespoon of buttermilk or soy milk. Flour the counter, and flatten the dough before rolling it out to 1/4 inch thick. Use a mason jar or a biscuit cutter to cut out circles. Place 1/2 inch apart on a cookie sheet lined with parchment or a silpat. Bake for 20 or 25 minutes until golden. These are equally good served with a cup of tea and a spread of jam for breakfast or with mango chutney and a cold beer for an evening snack. They are a pretty versatile and healthy snack providing plenty of fiber. Now that we have profiled both lavender and mint for gardening, I wanted to offer the recipe for these tender little cookies. In a large bowl or a stand mixer cream together the vegan butter and oil. Add the powdered sugar in 1/2 cup portions so it doesn’t fly, and beat the mixture until smooth and airy. Add lime juice, vanilla, chopped mint, and lavender, and mix until all is incorporated. Sift in the flour, baking soda, baking powder, and salt, and mix until smooth. Drop by the tablespoon onto a parchment or silpat-lined cookie sheet, and bake for 11 to 13 minutes, or until the edges are just beginning to turn golden.